Sydney Shop Girl: Colouring In Again. 'The Good Girl' by Mary Kubica. Colouring In Again. 'The Good Girl' by Mary Kubica. It all started with the nappy pants. Before we went away, I was in the spare room giving myself a pat on the back after lugging my two cartons for $50 bargain buy from Big W onto the nappy shelf to the left of the carton of wipe packets. My jubilation was short lived. One of my cartons was the wrong size and would have to go back from whence it came. The exchange was made and not wanting to waste the trip, I took my trolley further into the store. And discovered my new / second childhood hobby. Colouring in for grown ups or as the subtitle of my book defines it, 'colouring for mindfulness'. The 'Secret Paris' book cost $12 as did my top of the range 24 shade set of Crayola coloured pencils. Much has been said of the adult colouring in craze. It's not technically 'art therapy' (link to a very informative blog post that defines art therapy nicely) because for art to be therapy there needs to first be the context of a treatment orientated relationship between therapist and patient. The art created in the setting of this relationship can then be used as part of diagnosis, to guide other treatment modalities and to also monitor the patient's progress. I've surprised myself by just how much I've enjoyed colouring in again. Selecting colours, paying attention to scenes and objects on paper rather than on a screen and looking rather than reading have proven to be a welcome break from my usual online and text driven forms of down time. The thing is that the time I've been quietly spending with my pencils and colouring book has brought with it a genuine restfulness in my mind. The kind of calm that doesn't require the positive reinforcement loops of uploads to social media accounts or the addition of numerous items to virtual shopping baskets. It's been nice to simply look at the pretty things and scenes that I'm colouring in and enjoy them for what they are. To not feel the need to buy or own them to 'relax' or 'cheer myself up'. In a round about way, this colouring in business has been one step towards a long overdue declutter and redefining of what it is that makes me happy, content and less frazzled. It's not more things that I need in order to 'reward' myself, but rather just more time doing simple, enjoyable things that allow my mind to wonder into a world of colour and whimsy that everyday life doesn't let you travel to as often as you may like. Before I go, a quick book review. This is a follow up to the book I mentioned that I was reading in Perth. 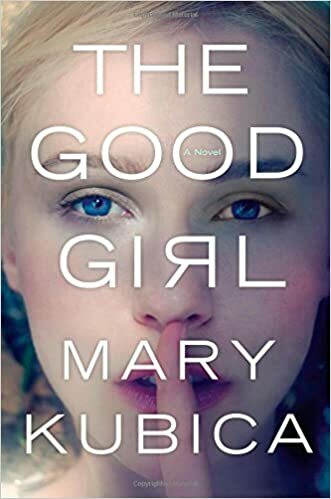 'The Good Girl' by Mary Kubica is a domestic noir thriller about Mia, an inner city art teacher who is the daughter of a prominent judge and Eve, a repressed socialite who harbours large amounts of guilt about the way she raised Mia. Mia is abducted during what appears to be the aftermath of a one night stand gone horribly wrong. The novel unfolds in chapters that switch between 'before' and 'after' the abduction. The plot unfolds from the perspectives of Eve, Mia, Colin (Mia's abductor) and Gabe (chief inspector on the case). Should we believe Mia's unlikeable father when he says that Mia 'is not all that she seems'? As counterpoints to the suspenseful race against time to rescue Mia, two unlikely relationships develop. Mia falls in love with Colin and their romance appears to be based on the the dynamics of the Stockholm syndrome. In his role as investigator and principle representative of the police force to Mia's family, Gabe begins to cross professional boundaries with Eve. He also steps into the life of Colin's mother and places her in a nursing home when it becomes clear she can no longer live at home alone without her now missing son's support due to the severity of her Parkinsons' Disease. No one is as they seem or as they are expected to be in 'The Good Girl'. I found the novel rapidly shifting narrative perspective difficult to fall into rhythm with in the first half of the book but my perseverance was well rewarded with the revelations of the final chapters. Kubica's characters are complex and multi layered, just as their relationships to each other are. If you love a good domestic noir page turner, this novel should be on your reading list. Mary Kubica as just released 'Pretty Baby' as her most recent novel after the best selling success of 'The Good Girl'. I'm off to download it right after I publish this post. I have been looking at Mary Kubica's books on iBooks. Might have to go there. Just finished "The dust that falls from dreams" by Louis de Bernieres. Love his books. Now reading "holding the man" by Timothy Conigrave. My sister just got herself a colouring book in order to navigate a particularly stressful phase in life. She says it's working very well. I thought maybe I'd give it a go but after seeing her book I'm having second thoughts... It's so intricate! She's got these pictures with acres of complicated paisley wallpaper and no. Not for me. I am a huge fan of the adult colouring books. I'm actually going to go and buy a few tomorrow along with some Derwent pencils that I could never afford to buy as a kid. Thank you also for the book recommend - I downloaded it last night and I'm already addicted. I think I'll probably end up finishing it tonight over a glass or two of wine.